Can MFP help people break the cycle of poverty in the Naxal–affected districts? There are instances that offer hope. Subelal Markam, a Baiga tribal of Korka village in Madhya Pradesh used to get just Rs 1.5 to Rs 2 per bamboo piece from middlemen. In 2007, the forest department helped him earn Rs 2.1 lakh from 11,000 pieces of bamboo through auction. It was the turning point in Markam’s life. 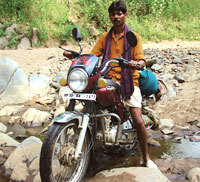 “I built a house, purchased a bike and gifted my wife a jewellery set,” he said. The next two years he earned Rs 74,000. Bamboo from Balaghat has a premium as it has more pulp and does not decay easily. The forest department has helped 17 other Baiga families of Korka earn Rs 20 lakh from bamboo auction in the past three years. The village was once considered a Naxal hotspot. Not any longer. “Conflicts come down automatically when you provide development opportunities,” said Ramgopal Soni, chief conservator of Balaghat circle. The tribals in Harranala village in Balaghat improved their incomes without official help. They pooled funds and bought mahua from the collectors at rates higher than what middlemen offered. “We sold the stock directly to the traders and returned the profits to the residents,” said Mangru Singh, president of the village gram sabha. Now middlemen who purchased mahua flowers from the villagers for Rs 3 to Rs 4 a kg are offering Rs 15 a kg. Harranala was one of the first villages in Madhya Pradesh to fight for the implementation of PESA. “We had two options—go with the Naxals or empower ourselves through PESA. We chose the latter,” said Singh. The gram sabha now ensures drinking water supply and takes care of agriculture. Most important of all, it manages its forests. If other forest communities are to benefit similarly, the first step would be to give them the right over MFPs. There are suggestions that MFP rights should be granted in scheduled areas without filing claims. In other areas, the authorities could be asked to prepare claims and present them to the gram sabha. N C Saxena, said the forest department should help villages in securing the market for their produce and take up forest productivity activities. Shanker Gopalakrishnan of the NGO Campaign for Survival and Dignity in Delhi said collectors must be given the same benefits as workers. A trade union model, free of government interference, could be viable, he said. Demand and supply forces would ensure people get the highest price for their produce.